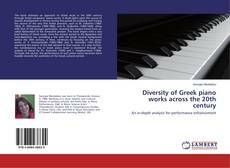 This book attempts an approach to Greek music in the 20th century through Greek composers’ piano works. It sheds lights upon the course of musical development in Greece during this period by analysing and tracing the oeuvre of the very first Greek pioneers, such as M. Kalomiris (1883-1962), D. Mitropoulos (1896-1960), and N. Skalkottas (1904-1949), along with that of the younger generation, covering the musical trends from so-called Nationalism to the innovative present. The book begins with a very brief history of Greek music, from the ancient period to the Byzantine and meta-Byzantine era, providing a link with the Greek musical background before the 20th century. It then, continues by focusing on the piano works of Y. Konstantinidis (1903-1984) and N. Astrinidis (1921-2010), examining the extent of the folk element in their oeuvre. In a step further, the contemporary era in Greek piano music is examined through the analysis of pieces by Th. Antoniou (1935) and L. Hadjileontiadis (1966). Through this course, the performance of such piano works becomes more feasible towards the aesthetics of the Greek cultural context.